Well, here we are at Day #2 of our February Release Sneak Peeks, and we’ve got MORE fun in store for you! If you didn’t get a chance to take in all the splendor of Day #1, then by all means, go back to our February 1st post and check those creations out. You’ll be glad you did! 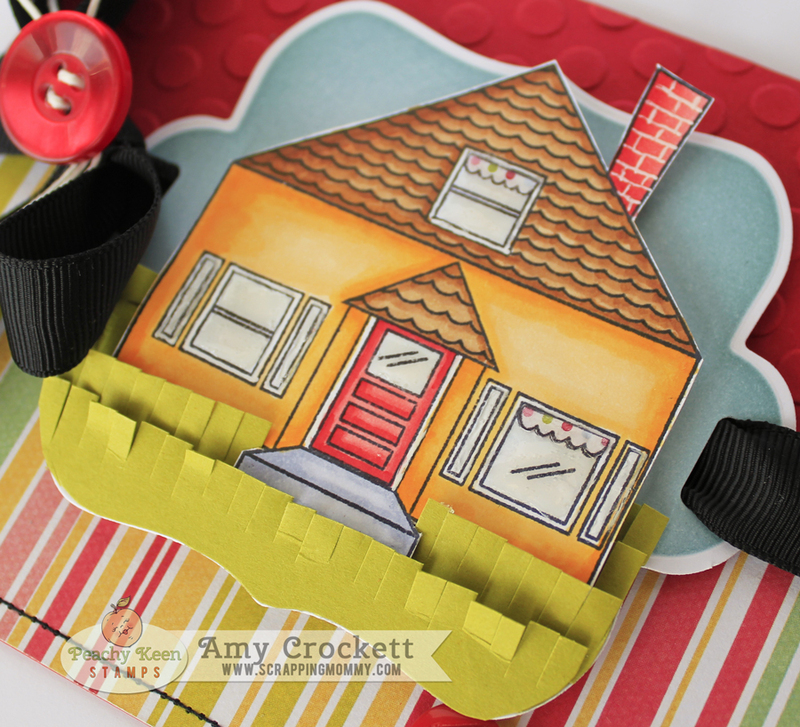 Today we are showcasing the Wright Avenue and Scalloped Rooftop Background stamps. There are so many great opportunities to use these stamps. From cards and projects for housewarming gifts, welcome to the neighborhood and congratulations on your new home, and so many many more! The possibilities are endless!! We’re so glad you could join us and we invite you back tomorrow for another round of sneak peeks with yet MORE new stamps! Now, it wouldn’t be a Peachy Keen Stamps event if we didn’t offer you a chance to win a prize, and no way would we break from a very popular tradition, so here’s what you can do to get a chance to win BIG. Leave a comment on all the sneak peek posts on the PKS blog and the Designer’s Blogs this week for a chance to win THE ENTIRE RELEASE! That’s right – one lucky person will win all 8 sets in this release! Somebody’s going to be a VERY happy stamper!! Thanks for joining us today and don’t forget to check out all the designer’s blogs for details about their projects and remember to leave a comment for your chance to win! Super cute Amy, love the colouring and the colours just make the card pop!!! Love your colors! Great job and I love all the little details you put into it. Oh my gosh! I love the brick chimney! You did a great job creating the perfect scene! Your card is just so darling I love how you chose to enhance the stamps Your coloring skills are just so brilliant as to what you do with your colors. You are such a talented gal. Great creative job!! Oh how I love this and the stamp set!!! Love the colors and the grass. Oohhh,...great card. Love the design and how you stitched the card and how you added the grass. Great color scheme too. Cute card!!! Would be wonderful to send this to a new neighbor! Adorable little house! Awesome colors! I love the colors and embellishments that choose for your card. Fantastic! I love that you ran the ribbon through main image! It makes it pop on the card! Love the papers you used as well. Great colors! Amy I just love every detail of this card. The colors are so bright and cheerful. Love that you embossed the background. You did a great job with this release. You are so very talented. 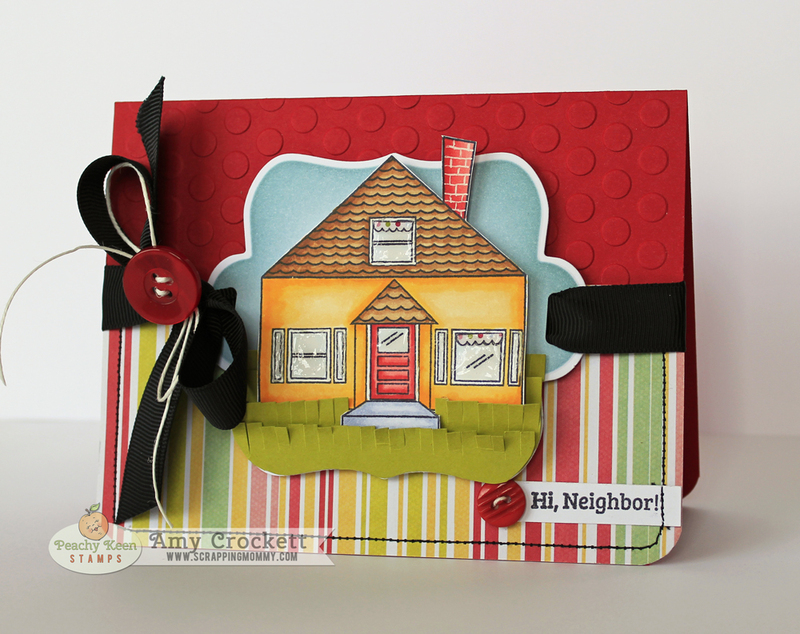 Love your card design and the bright colors you used! Cute card, loved all the detail:) Thanks for the inspiration! Oh I just love the colors you picked Amy!!! And the way you did the grass is so fun!